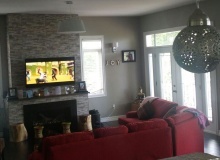 Excellent open concept, spacious on-the-beach property! STUNNING NEW CUSTOM BUILD! 3747 SF WITH EXQUISITE FINISHES-HARDWOOD, CROWN. MAIN FL OPEN CONCEPT WITH 10' CEILINGS. GOURMET KITCHEN WITH GRANITE COUNTERS & STAINLESS STEEL APPLIANCES OPENS TO FAMILY RM WITH GAS FIREPLACE AND 3 DOUBL E GARDEN DOORS WALK OUT TO LARGE DECKING WITH GLASS PANELS & MAGNIFICENT VIEWS OF THE LAKE & BEACH. UPPER LEVEL WITH 9' CEILINGS & 3 BEDROOMS EACH WITH OWN ENSUITES. SPECTACULAR MASTER RETREAT WITH COFFERED CEILING, ADJOINING SUN RO OM WITH WALL OF WINDOWS AND WALK OUT TO BALCONY OVERLOOKING LAKE. ENJOY THE VIEW. UNFINISHED LOWER LEVEL WITH 9.6' CEILING, ROUGH-IN BATH, WALK UP TO BACK YARD & LAKE!!! Alok Chadha isn't following anyone yet.